Turning myself into a foodie for the last few years, I have developed a keen interest in Modernist Cuisine. 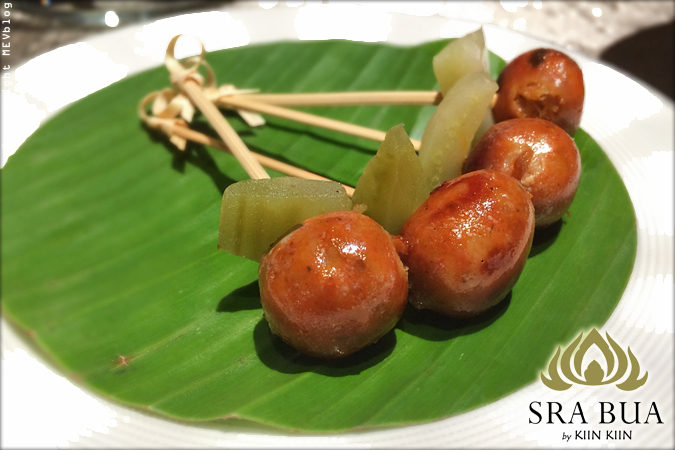 As one of the most renowned modernist cuisines in Bangkok, Sra Bua by Kiin Kiin is an obvious choice for our recent culinary journey. Chef Henrik Yde Andersen has made his mark with Kiin Kiin, Copenhagen, Denmark. With his powerful imagination and his rendering of Thai food using molecular gastronomy, Kiin Kiin became the first Thai Cuisine to be awarded a Michelin star. Under the same concept, Sra Bua by Kiin Kiin thrives in Bangkok, and recently earned its 21st place in Asia’s 50 best restaurant list of 2014. 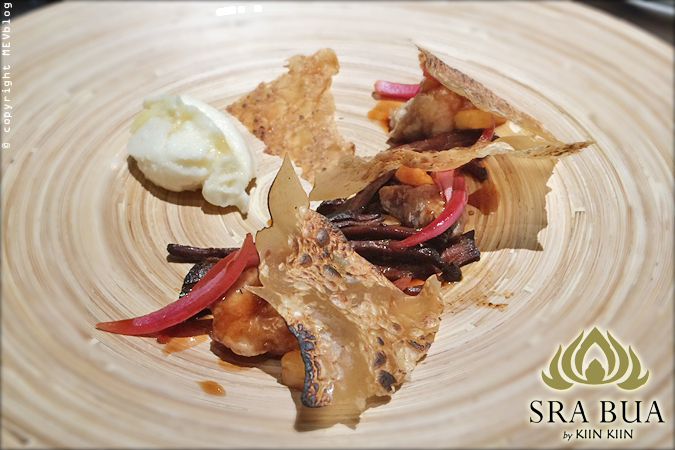 To fully appreciate their thoughtful dishes, we decided on “Sra Bua Menu” (2700 Baht++) which is the most comprehensive tasting menu available. and three “Nibblings” were staged as an overture to our meal – Soy Roasted Cashew Nut Meringue where soy added a surprising salty element to the meringue, typically considered as dessert, the crispy Kaffir Lime Leaf Scented Lotus Root and Prawn Cracker with Chilli Tomato Dip with the creamy Western-style dip as its twist. Followed temporarily were small servings of “Street Food” composed of the refreshing Prawn, Banana Blossom, and Coconut, the Miang Kham Cornette, which use pastry cornette instead of the usual Miang leaf, and the Pork Cracklings Green Chilli Dip with Marrow, where the level of spiciness is through the roof. We are Thais ourselves but the dish still brought some of us to tears (of course, I’m one of those whimps). I wonder how foreigners, the majority of their guests, would tolerate the spice but so far, I have heard no complaints from tables around me. Smoked Sausage was then served on a skewer, just like the way it would be sold on the street side. Prawn Bread with Sesame, a dish which mostly came in a square-shaped bread with a prawn ontop, now came in the form of tiny prawn bread ball. 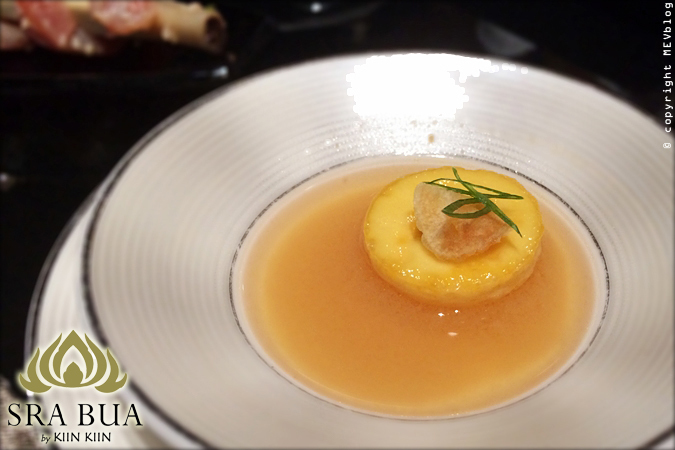 The tiny-portioned Umami Flan was served in the miso broth. And our last street food item, Tuna on Bone, came on a cleaned rib bone for the ease of picking up by hand. The next dish was undeniably one of the highlights of the day and featured exactly what we came here to experience – the witchcraft and wizardry, of course! Chefs transformed the traditional ‘Tom Yum Koong’ , most well-recognized and well-loved among Thai dishes, into a foam-masked beauty dubbed Tom Yam with Foamy Galangal & Baby Lobster. 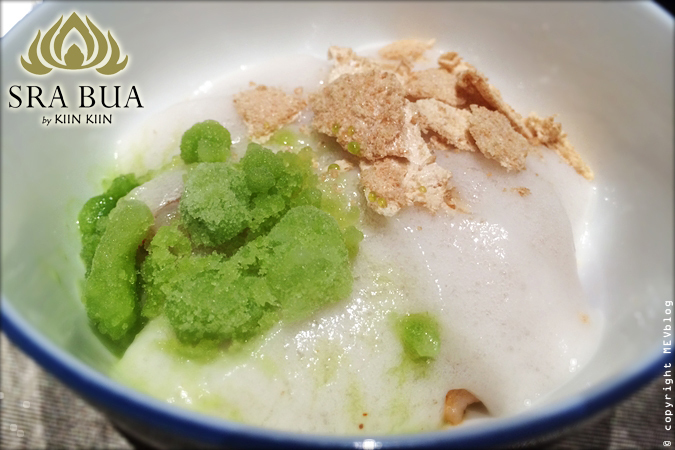 The airy foam ontop was made of coconut cream with a hint of galangal. The shaved ice-looking green patch was frozen Kaffir lime juice. The crispy-looking light brown pieces were bits of lemongrass meringue. And beneath these fanciful ingredients lay baby lobster so sweet and fresh. And of course, Tom Yum could never be a real Tom Yum without spicy soup, which in this case, was provided in a separate bowl. We eyed the bowls suspiciously, wondering whether this deconstruction would work or simply result in a traditional dish ruined. Luckily, it was the former. 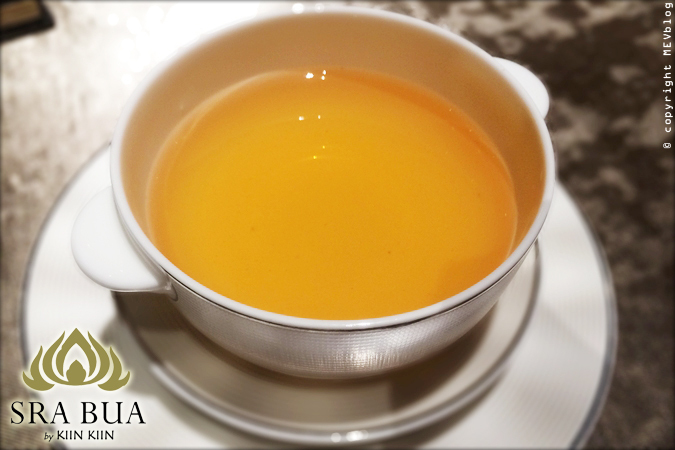 The temperature contrast between icy Kaffir lime juice and the hot spicy soup really woke up your senses. 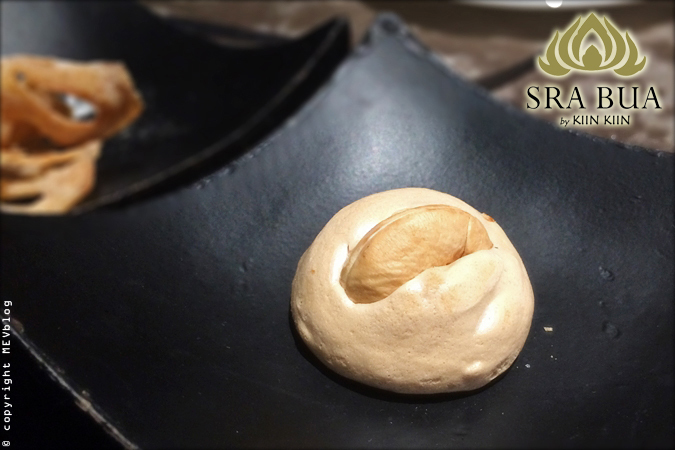 Crispiness of the lemongrass meringue enhances the soft touch of galangal foam. Everything came together when you added a little bit of everything into one spoonful. 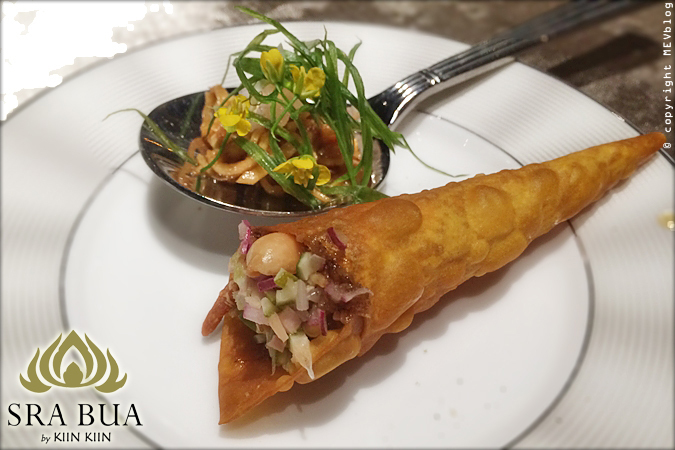 And the tricks played out in perfect harmony in your mouth, affirming the success in this sophisticated deconstruction of the dish. 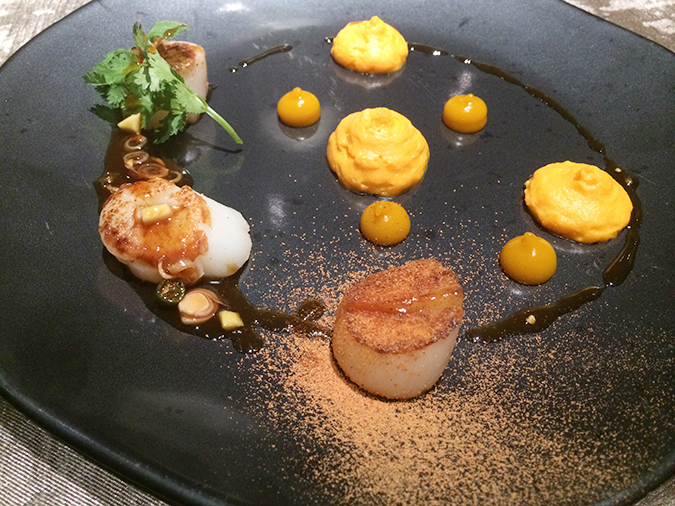 For the next course, we were presented with Scallops with Tamarind and Lemongrass . 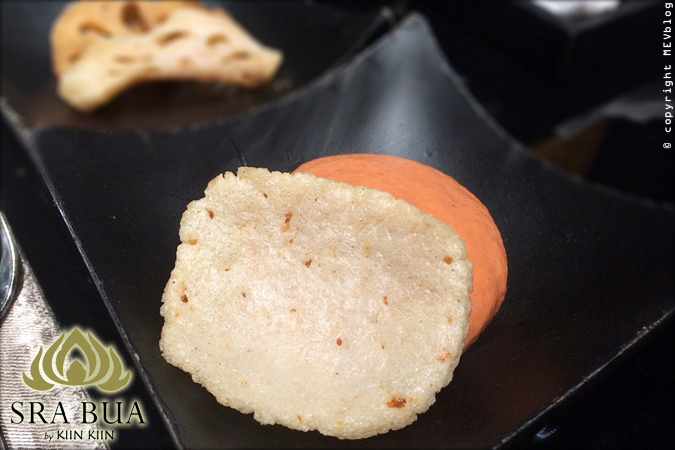 Carrot Puree and Carrot gel acted not only as a presentation tool but provided an additional creamy texture to the dish. Tamarind sauce made the dish both sweet and sour at the same time. The star ingredient, surprisingly, was the diced green mango, which lent the tartness that held the entire dish together. 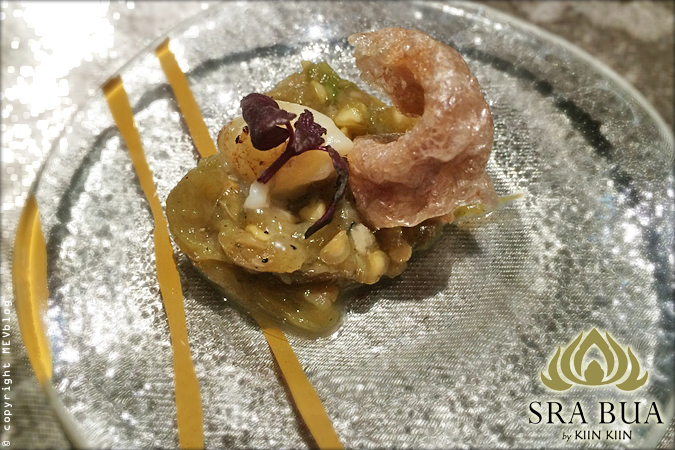 Without this sour mango pieces, the other components alone would made the dish overly sweet and much less appetizing. Next up was a colorfully presented Marinated cod fish with beetroots & Green Curry Pearl . The bright red beetroots seemed quite out of place in Thai cuisine. And the raw cod fish looked more similar to Japanese sashimi than anything I would call Thai. The green curry pearl reminded me of Dippin’ Dots. But yet again, once you put all those components in your mouth, all doubts disappeared. A burst of flavor from the flash-freeze green curry beads again revealed strong flavor of Thai spices that the chef does not shy away from. The intense spice together with fresh cod fish became a perfect combination. 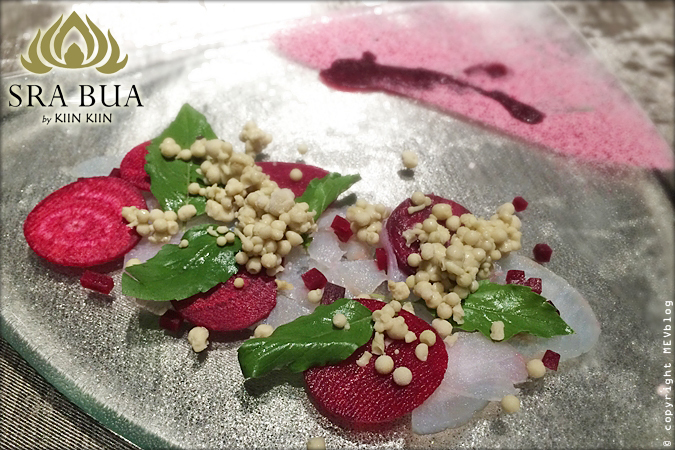 The beetroots gave both crispiness and contrasting texture and helped tremendously to cool down your palate. All in all, another very successful deconstructed Thai dish. A few following dishes were unfortunately outshined by the previous two seminal dishes. 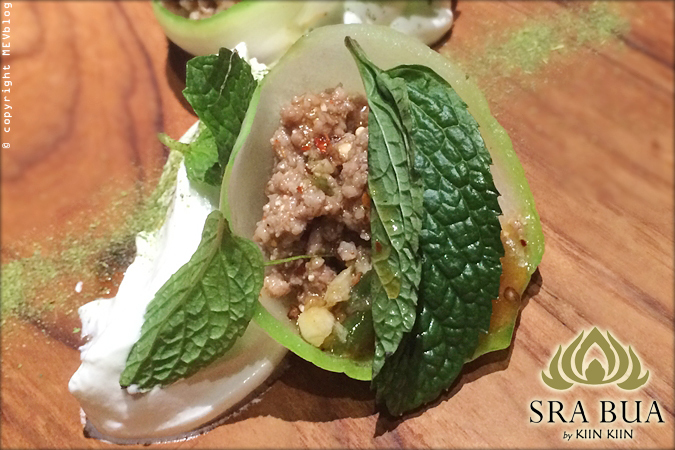 Laab Duck Salad with Mint & Spicy Marinade was prepared table side. The spicy sauce was mixed in the mortar and sprinkled neatly over the dish. The flavor of the spicy sauce was, however, way too sweet. Adding salt to the wound was the gigantic portion of meringue accompanied, making the entire dish almost like a sweet instead of savory dish. 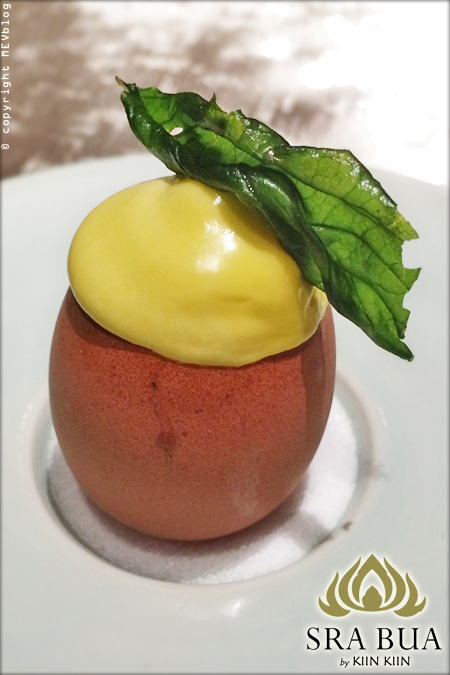 Kiin Kiin Egg with Wild Mushrooms & Holy Basil was decent. The creamy egg does go well with the slightly salty mushrooms. Finally, came the time for the main course, Braised Beef with Sweetbreads Sweet & Sour Pineapple . The beef was melt-in-your-mouth perfect texture. The utterly then onion paper displayed chef’s supreme technical skills. Still, having both diced pineapple and pineapple ice cream did make the dish overly sweet again and even with the braised beef, we felt like we were having dessert instead of the main course. 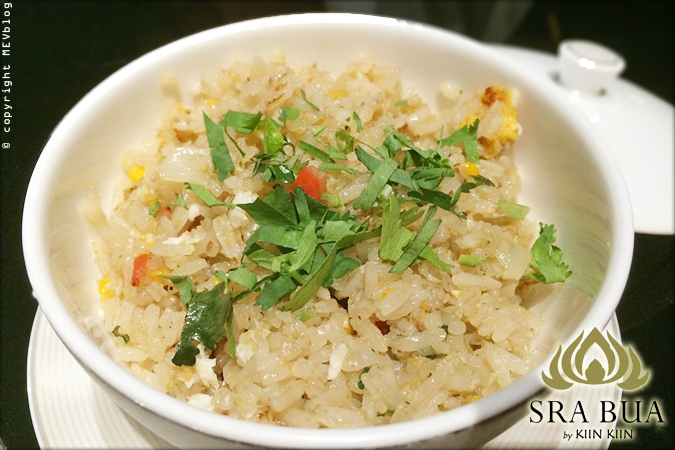 This dish is accompanied with a not-so-memorable fried rice. We were stuffed by the time main course was over. Still, there were to more dessert dishes to go. The first one blew us away with its creative presentation. The Snowball Cold Greetings from Chef Henrik came with a fluffy ball of cotton candy on top, looking like a cloud on a plate. 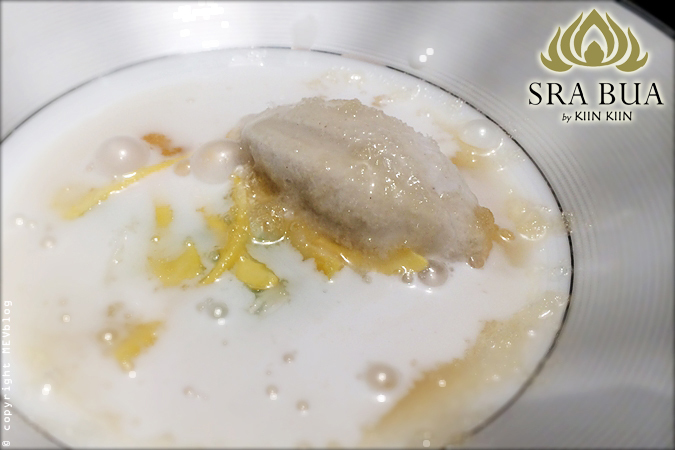 Once the coconut milk was pour ontop, the cotton candy melted away, revealing the banana ice cream, tapioca pearl and shredded jackfruit. 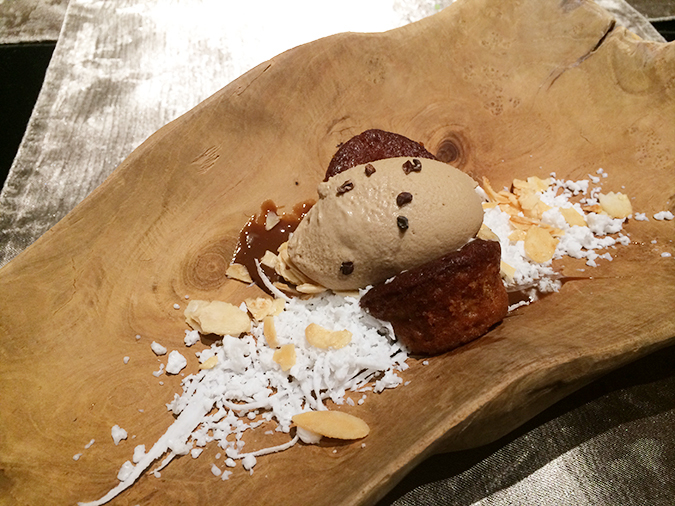 We ended the night with Banana Cake with Salted Ice Cream and Caramelized Milk . We were sadly too full to truly appreciate the richness of the cake and the ice cream. The overall experience was quite fantastic. 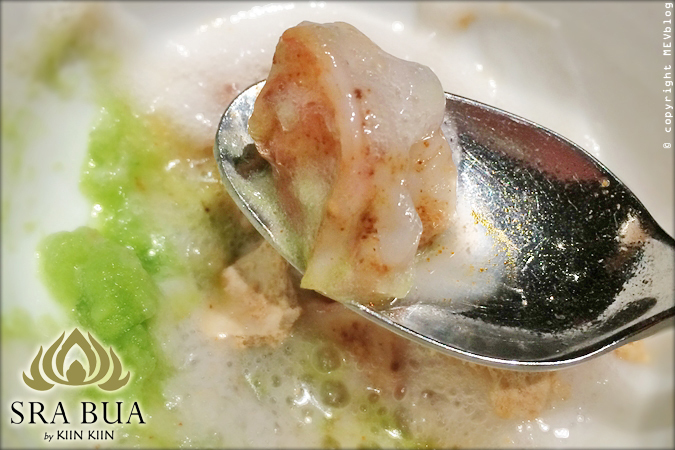 The highlight dishes such as Tom Yum and Green Curry would be in our memory for a long time to come. The service was meticulous. Slight downside was the way the waiter some time did not quite give us sufficient explanation these amazing dishes deserved. When asked to further elaborate, some information was outright incorrect e.g. I am not sure how Bok Choy was mistaken to be a cucumber but that what we were told!?! I think they only need to be more precise with the details of the elements on the dishes which they artfully crafted, which is a relatively easy fix. With that said, I would highly recommend Sra Bua for any adventurous foodies who would love to experience a fresh take on Thai food, modernist style.